Designed especially for electronic assembly to aerospace standards, the wire stripper combines high production rates with consistently high wiring reliability. It is especially valuable when working with fine gage wire. Each unit has adjustable strip and wire-gage stops. The rugged alloy blades have a long life under demanding production schedules. They heat to temperatures of 1700°F (926°C) in less than two seconds. They also cool instantly, eliminating the need for special racks or holding clips and providing complete operator safety. Completely self-contained, the standard wire stripper uses no external transformer or power supplies. The compact, solid state Temperature Control Unit supplied with some models is used to reduce blade temperature for certain insulation materials that burn, scorch or emit fumes when touched by the 1700°F (926°C) blade temperature. Because of the unique gage stop, adjustable from #10 to #38 AWG, the blades of the wire stripper do not exert any pressure on the conductor itself. In addition to positively eliminating nicks or deformation, this feature also protects the remaining insulation against damage, since the wire itself is not heated. The cut is clean and square, and no sleeving is melted into the wire strands. Insulation is easily cut at any predetermined point, and the unwanted slug is quickly removed. Wire ends are ready instantly for soldering or other means of connection. All standard models, 115 Vac, 60 Hz, 60 Watts. 220 Vac, 60 Hz, 60 Watt is optional. Model TW-1: “Standard” Model – For general production work. Completely self-contained. 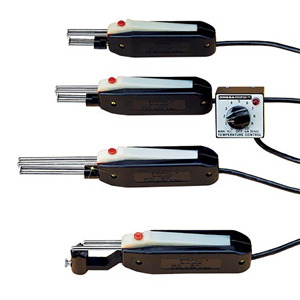 Has adjustable stops for both wire gage and strip length. Model TWC-1: Controlled Temperature – Has solid state temperature control. Temperature adjustable from 100°F (38°C) to above 1700°F (926°C). Solid state control mounts as electrical outlet, eliminating bench clutter. Blades reach selected temperature in less than two seconds. Model TW-2 LN: Long Nose – Strips up to 3½" in a single stripping action. Same operating features as the TW-1, except unit has four extra-long electrodes. Useful for stripping in inaccessible areas. Model TW-6: Cable Stripper – Designed especially for slitting and removing the outer coverings of cables. Removes PFA coated as well as low temperature coaxial coverings. For coax cable or wire diameters 15.8 mm (0.625") or less. Model TWC-6: Controlled Temperature – Same as the TW-6, but includes temperature control unit for adjustments from 100°F (38°C) to above 1700°F (926°C).